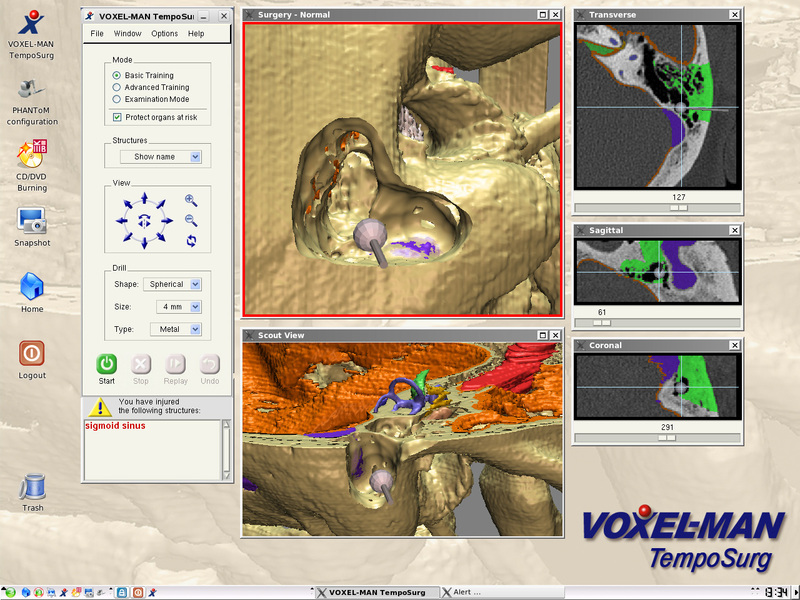 Voxel-Man TempoSurg was the first commercially available surgery simulator for drilling access to the middle ear. In cooperation with Spiggle & Theis, a leading manufacturer and distributor in otorhinolaryngology, it was introduced to the market in 2005. 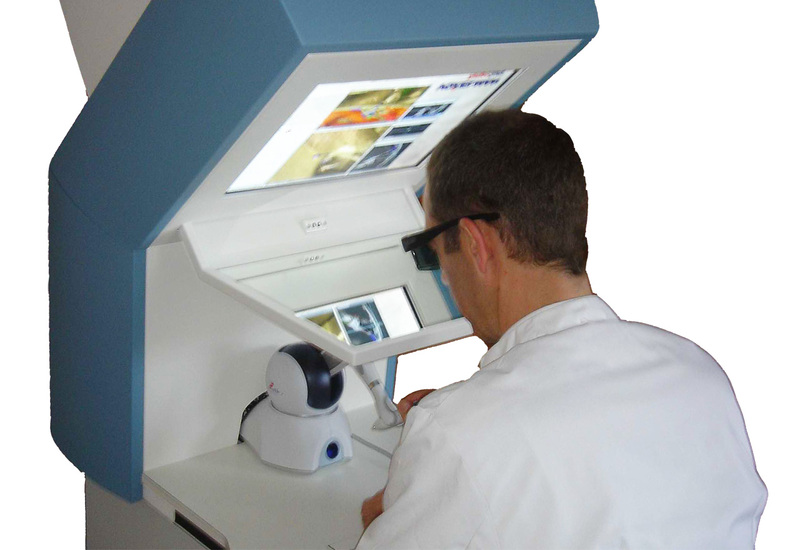 The trainee is seeing the virtual surgical site which is displayed in stereoscopic mode, and controlling the drill with the handpiece of a force feedback device. The simulated procedure thus becomes very similar to the real one regarding the patient’s orientation, the surgeon’s viewing direction, hand orientation, and the haptic feeling. The trainee may choose view angle, magnification, type and size of the drill, as well as its rotation speed. In addition, the user may navigate with three orthogonal cross-sectional views. For surgical training, a set of models derived from real patient cases with labeled organs at risk was provided. For the early training phase, coloring of the organs at risk both in the 3D surgical site and the cross-sectional views can be provided and alarm can be given when an organ at risk is injured. Different levels of support can be chosen. The realistic drilling and milling of hard tissues such as bone or teeth was made possible through groundbreaking work in the fields of digital volume sculpting and haptic feedback. As a unique feature, our algorithms are working with subvoxel accuracy, resulting in a highly detailed visual and haptic rendering of the surfaces. In 2011, Voxel-Man TempoSurg was replaced by its completely redesigned successor Voxel-Man Tempo, which is based on a Windows platform. Among others, it features two-handed operation with drill, suction and bleeding, an advanced skills assessment for automatically scoring the trainee, real-time adjustments of the viewing position, online software updates, and a compact setup with a 3D LCD display. Rudolf Leuwer, Andreas Petersik, Bernhard Pflesser, Andreas Pommert, Boris Tolsdorff, Karl Heinz Höhne, Ulf Tiede: VOXEL-MAN TempoSurg: A Virtual Reality Temporal Bone Surgery Simulator. J. Jpn. Soc. Head Neck Surg. 17, 3 (2007), 203-207. Andreas Petersik: Realistische haptische Simulation materialabtragender chirurgischer Eingriffe. [Realistic haptic simulation of material removing surgical interventions]. Dissertation, Carl-Friedrich-Gauß-Fakultät, Technische Universität Braunschweig, 2007. Bernhard Pflesser, Andreas Petersik, Ulf Tiede, Karl Heinz Höhne, Rudolf Leuwer: Volume cutting for virtual petrous bone surgery. Computer Aided Surgery 7, 2 (2002), 74-83. Rudolf Leuwer, Bernhard Pflesser, Markus Urban: Die stereoskopische Simulation ohrchirurgischer Eingriffe an einem neuartigen 3D-Computermodell. [The stereoscopic simulation of otosurgical approaches by means of a novel 3D-computer model]. Laryngo-Rhino-Otologie 80 (2001), 298-302.